Engineer Peter Knight gave a fascinating talk and slide show to the Kimberley Society called “Construction of the Ord River diversion dam – An illustrated history” on Wednesday 2 September. Mr Knight said this was his first big career opportunity as a young engineer. 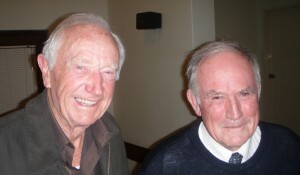 He is pictured here with his old boss John Lewis, who designed the dam.